55 Ramparts Road, Te Anau, Southland, New Zealand. We are located just 6 km from Te Anau. When arriving from the town centre, turn right on Ramparts Road and you will see our sign on the left side of the road. 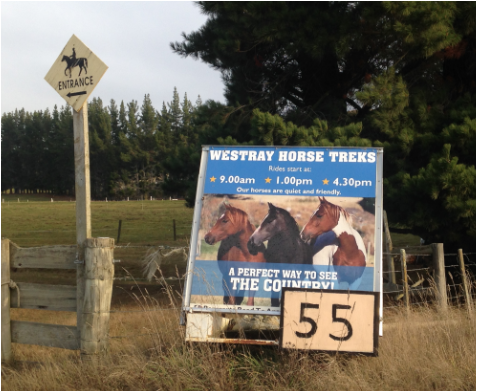 Follow the road until the next sign: HORSE TREKS CAR PARK. If for any reason you find it necessary to cancel your trip, please notify us as soon as possible. We do not ask for a deposit. However we do ask for credit card details to secure your booking. No money is taken unless you do not turn up at time of departure, or fail to cancel your booking 24 hours in advance. Cancellations made less than 24 hours before departure time will be charged in full. Copyright © 2017 Westray Holdings Limited. All Rights Reserved | Designed and Hosted by Design Shore Technologies NZ Limited.